Introducing the Decade “Saki-Gake” Edition Air Suspension! As the industry leader of integrated air suspension systems, we felt it necessary to introduce a new, cost effective and quality air suspension system. The Decade System is also commonly known in Japan as the “Saki-Gake” System. The word “Saki-Gake”translates into “a pioneer or premier of its group” which perfectly describes our new product. ACC has been committed to manufacturing air suspension units for over 10 years and we feel that it was time for someone within the industry to focus on cost effective units without sacrificing quality. With that in mind, we introduced our revolutionary Decade System which allows for a customizable ride height without sacrificing quality. We utilize original Firestone airbags which boast high durability through its 2-ply structure. These Firestoenne sleeved airbags are well suited for long-term service. They can be rebuilt and if necessary, can also be replaced. To ensure the best possible ride quality, our Bridgestone sleeved airbags are built with similar structural designs that can be found on OEM Lexus air suspension. These Bridgestone sleeved airbags are well suited for long-term service. They can be rebuilt and if necessary, can also be replaced. We have adapted a Japanese made damper which has a proven reputation of providing improved driving and handling characteristics. Our Decade edition has a basic ride height adjustment range of 4-5 inches. Engineered to be installed in a bolt-on fashion (or at most, with minor modifications to the knuckle arm). 4-wheel independent switches allow the suspension to be fine-turned to your precise performance needs. The stainless steel braided leader hose has excellent flexibility and comes with a buit-in check valve to prevent back flow to the air tank. A schrader inflation valve allows for a quick fill up of your air tank during an emergency situation. Our 380C Viair compressors have excellent durability for long-term service. Choose from a 4-gallon stainless steel tank or 4-gallon pancake tank. Pressure switches are pre selected for each of our applications. Unique “W-Lock” fittings squeeze the air line from both the inside and outside to prevent air leaks. Each kit includes 100ft D.O.T. 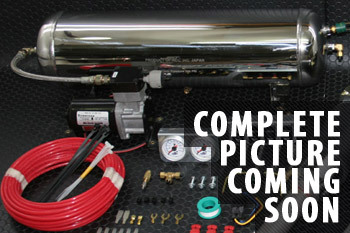 approved 1/4″ air line and other meticulously selected components. Operation manuals and installation manuals are both included for each of our applications.